Q: First off, congratulations on your first feature Imitation Girl picking up distribution! How did you connect with your distributor? Natasha Kermani: We were very lucky to be invited to a UK genre festival called Fright Fest - it was there that we met Shaked Berenson, who is one of the owners of Epic Pictures. Epic was about to announce a new genre label, and Shaked sent our screener directly to Rob Galluzzo, the curator. Rob liked the film, and we had a great initial meeting and ended up being a part of their slate. So our story is really an example of why it’s important to go to Festivals and meet as many folks as possible! Q: What is the most surprising thing you’ve learned about the process? NK: There’s a pretty steep learning curve, and I’ve tried to learn as much as possible throughout the process. I’d say the number one thing is wrapping my head around how long the process actually takes - there’s a lot of stamina required with a big project like a feature film, and getting it to festivals is actually not even close to the finish line. So it’s very important to make sure that as the filmmaker you are prepared not only for the film’s production, but also the months (years!) of continued attention the film demands once it’s actually completed. Whether that means saving up some extra money to cover the time that you won’t be working while on the road with the film, or making sure you’re sleeping enough between networking events, it’s just important to be aware that it’s a marathon… not a sprint. It was also a lovely surprise to get to talk to viewers who had seen the film, to hear their interpretations of the story or which characters they were drawn to, etc. A film really does take on a life of its own, and I loved seeing the conversations that came out of it once it started playing. Q: What opportunities has your first feature opened up for you? NK: I have experienced a difference in terms of being taken seriously “in the room,” whether pitching a new project of my own or being considered for something new that’s already in development. My producing partner and I are developing a new film that is slightly bigger budget, and our goal is to continue building up our budgets so we can continue to raise the ante as we move forward with our projects. I think now that we have a micro under our belt, we are able to realistically have conversations about financing on a larger scale. Q: Can you tell us more about your experience as a “technical” director? What drew you to special effects and stunt work? NK: Even in film school I found myself working on really high concept and visually complex genre material, so I started learning about vfx, etc., almost out of necessity. I was lucky enough to be friends with an older student who is an incredible vfx artist, and learned so much from him over the years. I am friends with some amazing stunt performers back in New York, so again, it was really about learning as much as possible from those guys - their approach, how to pull something off while staying safe, and so on. I have a pretty solid technical understanding of cameras from when I was in assistant positions on set, and I try to at least always have a basic understanding of what’s going on with the latest technology. I always think about the technical in terms of accomplishing the creative, rather than the reverse, so I’ll usually learn a new technique when I am trying to achieve a specific effect or stunt for a project. I think women are often shy about learning the “scary” technical aspects of filmmaking - but I have noticed that most dudes like talking about their specialty so… go ‘head and let ‘em talk! Once you get over the initial learning curve, this stuff can be really fun. Q: How have you been able to navigate this predominantly cis/white/male space? 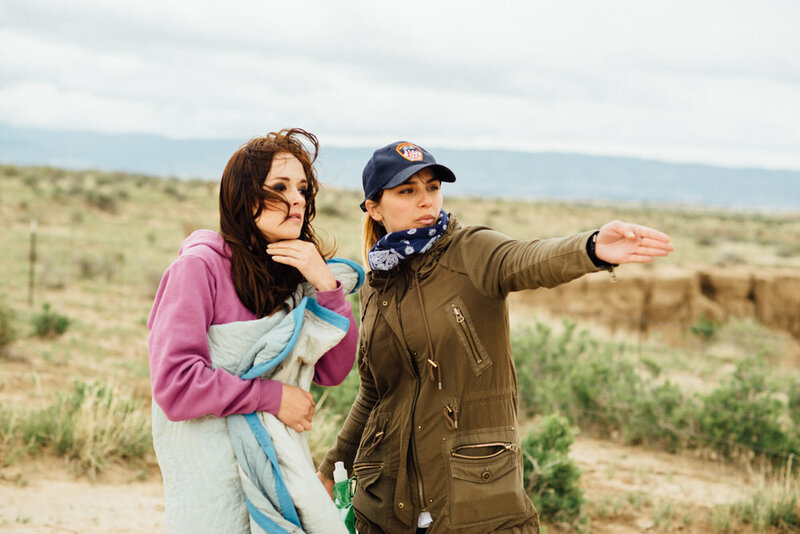 Do you have any advice for up-and-coming female directors? NK: Well, we come into the business already at a disadvantage, so I think the key is not being reticent about inviting yourself to the table. Ask questions, stay focused, learn as much as you can. Some of my greatest collaborators are cis/white/male, and many of them are genuinely excited to see a shift in the industry happening, to hear new stories and new perspectives. It’s important to find those allies. Recently, it’s been exciting to connect with older women in the industry. While they are certainly rare, it’s been rewarding to speak candidly with them about my experiences, and to get their point of view. This is a really difficult path to take, with lots of ups and downs, but if you truly believe that you have a story to tell, then fill yourself with that creative energy and go forth - and please, please, don’t be shy. Q: Let’s take a step back. How would you describe your work? What do your projects have in common? NK: I love science-fiction, and I think there’s a degree of the fantastical in almost all of my work. With that said, I try to keep the work grounded and often will pull from my personal experiences or people in my life as I’m piecing the story together. And from film projects and screenplays, and even with branded content, I’m always looking to find a way to make the world appear more cinematic, to summon a sense of wonder and (hopefully) inspire conversation, dreams, questions... Typically my lead character will be female, since that’s the perspective that I find easiest to access, and often she is someone who is navigating a path between two worlds, or two identities. It’s been pointed out to me that I am, in fact, a Gemini, so that may have something to do with it! I also think growing up as the only child of a mixed marriage, I was exposed to two very different, equally beautiful cultures, but never fully a part of either of them. As a result, I think I’ve always been fascinated by the place that exists between all our various universes. NK: My producer, Tim Wu, and I are putting together our next film, which we plan to start shooting this October. I’m also learning as much as I can about the world of episodic directing and television! It’s very different, but a fun and exciting challenge. And I’m always writing! Directors have stretches of time when they are in between projects (sometimes longer than we would like), so it’s important to try to stay productive and have lots of material on hand. Q: Lastly, where can we follow your work and your next steps? NK: You can find me on social media (@natashakermani) or visit my website at www.natashakermani.com for updates!